1. Make rhubarb rosettes: Using a mandolin slicer set to the thinnest blade setting, take four stalks of rhubarb you have trimmed to 10-inch lengths and, one at a time, carefully, repeatedly push each stalk through the mandolin to create lengthwise strips of the rhubarb. Take each strip and starting on one end, roll up the strip to make a curl. Skewer each curl with a toothpick. Continue until you have enough curls to fill the bottom of a 9-inch cake pan. Place rosettes in a tall container of ice water, cover. Refrigerate overnight. 2. Make banana syrup: Place 10 frozen bananas in a microwaveable bowl. Microwave on high heat for five to six minutes until bananas are completely thawed and have released their juice. Place all in a fine mesh strainer over a bowl to collect the juice. You should have a bit more than 1 cup of juice—if there is a bit more, that is fine–you will be reducing this to make the syrup. Reserve the banana pulp for another use. 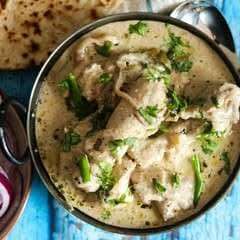 Place the banana juice in a heavy-gauge pot over medium low heat. Simmer, whisking occasionally, until the juice has reduced almost by half. Remove pot from heat. Set aside. 4. 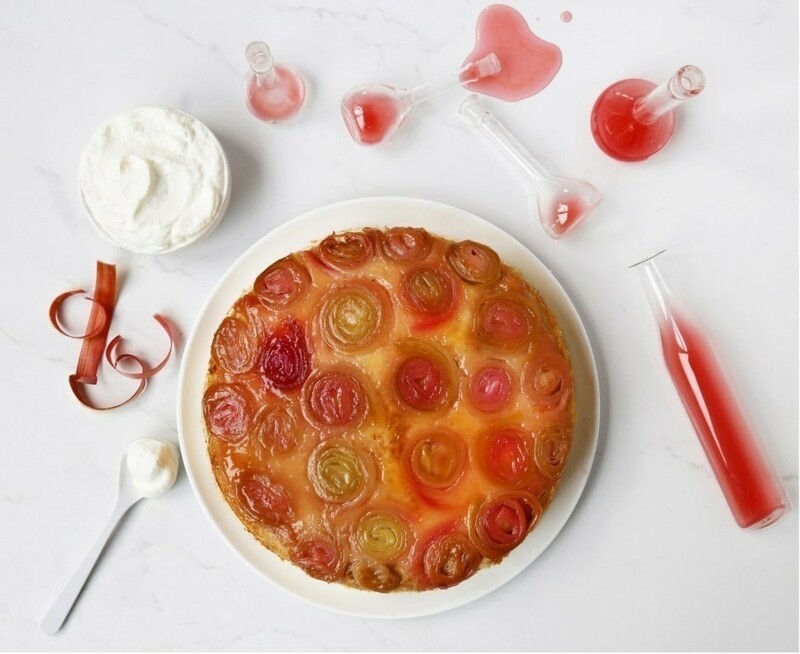 Make rhubarb rosette upside down cake: Preheat oven to 350. Remove rhubarb rosettes from ice-water. Blot dry on kitchen toweling. Remove toothpicks. If the rosettes have split a bit, it’s okay: just trim the ends and discard the trim and toothpicks. Generously butter and line a nine-inch cake pan with parchment round. Looking at each rosette, determine which side is “prettiest.” Dip each rosette (both sides) in sugar. Place each sugared rosette—“prettiest” side DOWN—flat on the bottom of the cake pan. Continue until you have fit as many of the rosettes as you can to cover the bottom of the pan. Dot with 1 Tbsp of slivered butter. Cover cake pan with foil. Place in preheated oven and bake rosettes for 12 minutes. Remove from oven. Remove foil. Very carefully, pour off the juice and butter that has collected in the pan into a bowl. Place the bowl of juices in the refrigerator to completely cool while you make the cake batter. 5. Make cake batter: In a small bowl, whisk egg yolks with 1/4 cup of the milk, the sour cream and the vanilla. Set aside. In the bowl of a stand mixer with whisk attachment, combine the sugar, cake flour, baking powder and salt. Whisk for two minutes at medium speed. Turn of the mixer to add the butter cubes and remaining ½ cup of milk. Whisk for two minutes at low speed, scarping side of bowl as needed, and then increase to medium-high speed until you have a smooth, thick batter. Turn mixer off to add the reserved egg/milk mixture in three parts, beating until just incorporated after each addition. Set aside while you finish the syrups. Remove the chilled rhubarb butter juice you collected from the refrigerator. Skim off the butter solids and place these back in the cake pan. Pour the collected juices through a fine mess strainer into a small, heavy-gauge pot. Add ½ cup of the reserved rhubarb syrup. Add all of the reserved banana syrup. Heat over medium heat until the syrups begin to bubble, continue heating whisking constantly until the mixture has reduced again by just about half, to a thick syrup. Remove from heat. Drizzle 3 tablespoons of the syrup over the rhubarb rosettes and butter in the cake pan. Save the rest of the rhubarbanana syrup to serve with the cake. Spoon all of the cake batter over the rhubarb rosettes, spreading to smooth the batter. It will completely fill the pan. Bake at 350 for 35 minutes. (Note: the cake will dome somewhat, but it will level as it cools.) Remove cake from oven to cooling rack. Cool for 15 minutes. Using a sharp knife, slip knife around the inside edge of the cake pan to ensure it will loosen from the pan when you invert the cake. Place serving platter over the cake; invert to release the cake from the pan. Serve slices of the cake with whipped cream, iced cream or crème fraiche and a drizzle of the reserved rhubarbanana syrup.